Buford Betty: Three Dog Night. I hope everyone had fabu weekends! I had to work most of Saturday, so mine was cut too short, but we still had a good one. Saturday was a rainy mess, but it cleared up for a nice Sunday afternoon. After dinner, we took the sillies to the park and then we all went to Bruster's for some ice cream. Gertie and Charlie in their preppy pink and green harnesses. 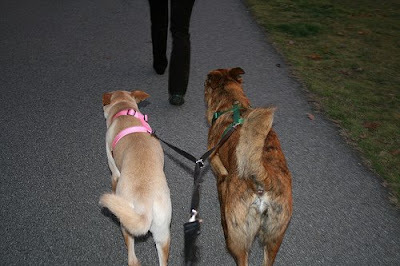 The double leash never worked well for Belly and Charie together. Belly's just too independent. Plus, Gertie and Charlie are closer to the same heighth... it works much better with the two of them. They've become great little walking buddies. Belly's always gotta be out in front. And she must pee on every spot any other dog has peed on. Including hiking her leg on fence posts. Because that's so lady like. Oh are we in heaven, or what?!?! Belly's got the *psycho* eyes going on. She's thinking, "OMG, OMG, OMG!" Gertie had to brace herself. This ice cream is serious stuff. 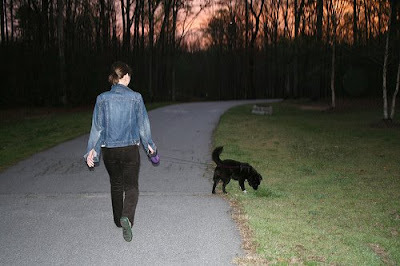 That double leash is genius! I have never seen one of those. I will be looking though, my jacks would love it. Especially Dottie, since she is constantly choking herself when trying to keep up with Fancy. This might just be the solution, thanks for sharing! So cute! Devil Dog loves going for ice cream too- in fact one of the places we go even sells a little doggy-dish which comes complete with a biscuit on top. I swear, I will never quite get over how much Charlie and DD look alike! Too cute!! 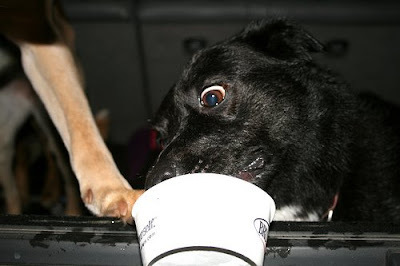 I buy frosty paws at the grocery store for my pooch. 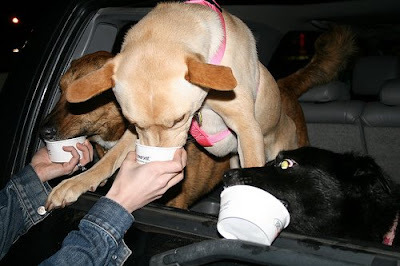 Oh how dogs love ice cream. 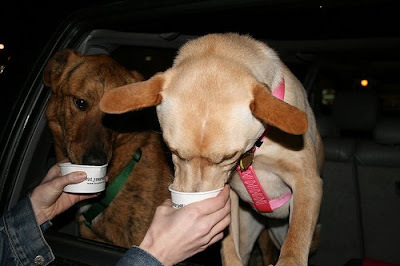 Oooh- Sadie has never had ice cream before. She is jealous! Those pics are just beyond cute!! My doggie's name is Charly too! He loves his peanut butter ice cream...the psycho eyes are awesome! Those three are too cute! I was just going to mention how much Charlie looks like Libby's DevilDog...looks like I'm not the only one to make the connection.